ACA Compliance | Who qualifies for coverage? ACA COMPLIANCE: WHO QUALIFIES FOR COVERAGE? I’ve determined my business is an ALE. How do I know which employees qualify for health insurance? There are two methods of determining full-time status for the purpose of identifying which employees are eligible for health coverage. It’s important to note that the look-back method cannot be used to determine if your business is an ALE. Monthly measurement method: With the monthly measurement method, the number of full-time employees is determined based on the number of hours worked during each calendar month. If an employee works an average of at least 130 hours during a month or an average of 30 hours per week during a month, they’re considered a full-time employee. Within the monthly measurement method exists an alternative method of determining full-time employees, called the weekly rule. This method takes into account differing payroll periods, and allows employers to determine full-time status based on the number of hours worked over successive one-week periods. Using the weekly rule, full-time status is calculated for certain months based on the number of hours worked over a four-week period. Other months are calculated based on a five-week period with the fifth week including either the first or last day of the month, but not both. If you’re calculating full-time status using a four-week period, employees must exceed 120 hours of work to be considered full time. If using a five-week period, employees must exceed 150 hours. Look-back measurement method: With the look-back measurement method, the number of full-time employees for a future period is based on the number of hours worked during a specified previous period. That previous period, known as the ‘measurement period’ must be a span of at least three months, but less than 12. Each employer can decide the length of their own measurement period so long as it falls between three and 12 months and is applied equally to all employees in the same category. Once you’ve identified the number of full-time employees during the measurement period, you must offer health coverage to all eligible employees for the length of what’s called the stability period. The stability period must be at least six months, or as long as the measurement period. This means if your measurement period is three months, your stability period must still be a minimum of six months. But if your measurement period is nine months, your stability period must be also be a minimum of nine months. The look-back measurement method is used solely to determine whether or not individual employees qualify for health coverage. This method cannot be used to determine number of full-time employees for the purpose of establishing ALE status. What about for employees whose hours are especially hard to track? Not all employees work traditional 9-5 office jobs, or even traditional hourly shifts. For certain employees, like adjunct faculty members, commissioned sales reps and airline workers, time and attendance tracking can be a daily headache, as well as a huge financial burden if compliance requirements aren’t met. According to IRS specifications, employers must use a “reasonable method” of tracking and crediting work hours for employees with more unusual work schedules. This “reasonable method” must be consistent with the requirements listed under the employer shared responsibility provisions. Can I offer health insurance to employees who don’t qualify? Yes. Employers can always decide to offer coverage beyond the government-mandated minimum. And many do just that. 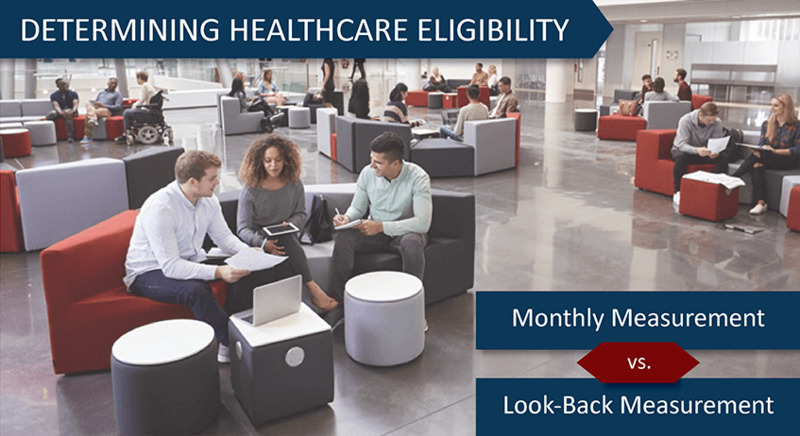 According to a report by ADP Research Institute, almost half of midsized employers said they planned to or already had extended health coverage to employees who were non-ACA-eligible in 2014. That number jumps to over 60% for large businesses. But why would an employer want to extend health coverage to non-ACA-eligible employees? For starters, it makes budgeting for companies significantly easier. When an employer knows exactly how many employees they plan to offer health coverage to, they can more accurately budget for the upcoming months and years. It also greatly reduces the risk of time and attendance tracking errors. But the leading reason employers choose to extend coverage beyond the mandated minimum has less to do with budgeting and more to do with talent. 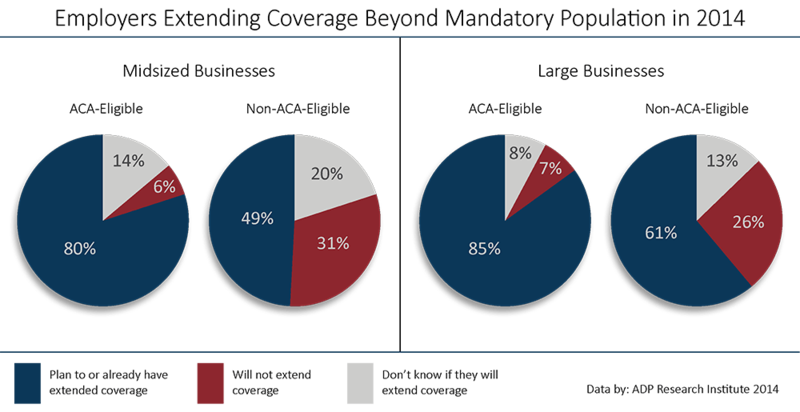 According to the ADP RI study, about three-quarters of both midsized and large businesses said they decided to extend coverage to attract top talent. What are some of the biggest ACA compliance challenges for employers? Understanding ACA requirements for employers is only the first of many steps to staying compliant and avoiding large fines. Once you’ve identified if your business is an ALE and to which of your employees you must offer health coverage, the next challenge to tackle is accurately tracking employee time and attendance - a feat many employers have struggled with for decades. According to the ADP RI report, even among employers who said they believed they could access all their necessary time and attendance data, 38 percent of midsized employers said they didn’t feel confident they would be able to compile and report the data to the IRS by the deadline. That number jumps to 39 percent for large employers. 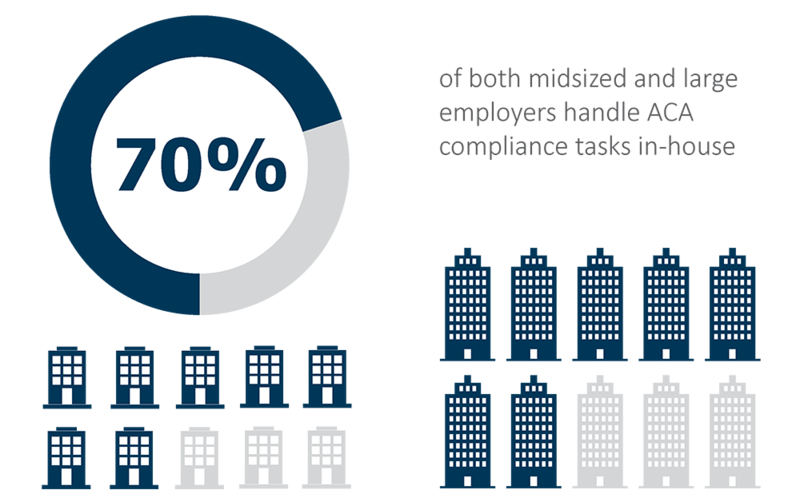 Despite the lack of confidence businesses feel about staying ACA compliant, almost three-quarters of both midsized and large employers handle ACA compliance requirements inhouse. This could be an issue for businesses that struggle with information silos, or pockets of data that don’t integrate with each other.